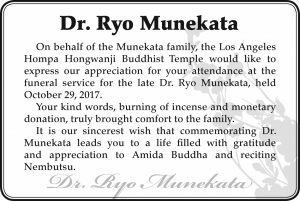 On behalf of the Munekata family, the Los Angeles Hompa Hongwanji Buddhist Temple would like to express our appreciation for your attendance at the funeral service for the late Dr. Ryo Munekata, held October 29, 2017. Your kind words, burning of incense and monetary donation, truly brought comfort to the family. It is our sincerest wish that commemorating Dr. Munekata leads you to a life filled with gratitude and appreciation to Amida Buddha and reciting Nembutsu.